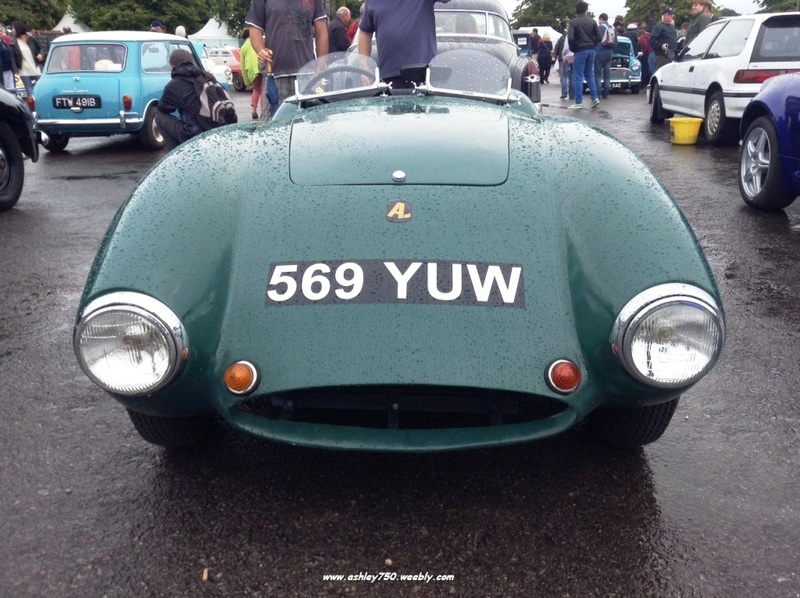 This is another Ashley 750 that I had no record of as existing, it has not shown up before and has not appeared on any of the registration index's that I have seen, hence it didn't appear on mine, until now. 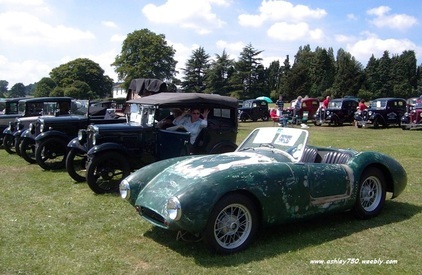 This is the event that attracts over 38,000 visitors to The National Motor Museum. they both took photo's of it and the next day emailed me. Within an hour of that I received another email from Nigel this time, he had also been at Beaulieu, seen the car and as he owns his own Ashley 750 took photo's which he passed on to me. Within a couple of days I then received Nick's other photo's, he seems to have been there on a different day as it has been raining on the Ashley just before he took them. My thanks to Nick and Nigel for thinking of the Ashley Laminates website and sending me the photo's to use on the site, it's these actions that will bring all the Ashley's together for the future. 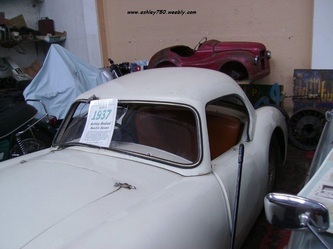 As I mentioned this Ashley 750 had the For Sale notice out with the owners name and telephone number shown, Nick had taken a photo of the notice and sent it to so I just had to phone it and get to know a bit more of the cars past history. I chose the wrong time to make the phone as no one was home and I had to leave a message with my website/email details and hope for the best, fortunately Peter checked the website and emailed me the next day with more information and more photo's. It was seen driving around South Wales in the late 1960s, registration number JJ 3050. 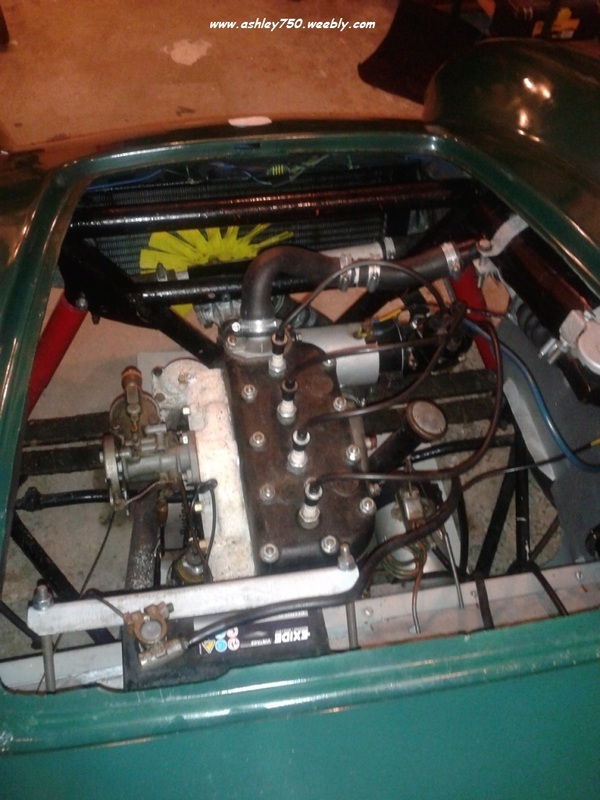 It was then advertised for sale in 1972, my father went to look at the car hoping to find an Austin 7 sports engine. The car was stored at the back of a garage, it looked like it hadn't been driven for a few years. 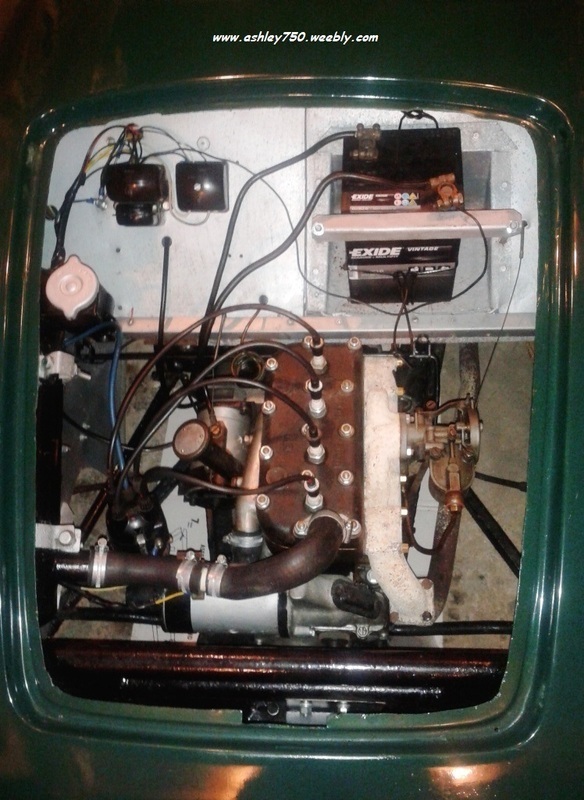 The engine was a standard Austin 7 engine so my father wasn't interested in it. 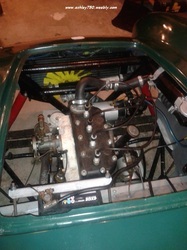 The car again appears for sale (at a much reduced price) in 1974 and my father buys it for the engine and gearbox. We were soon advised that we had bought an Ashley. 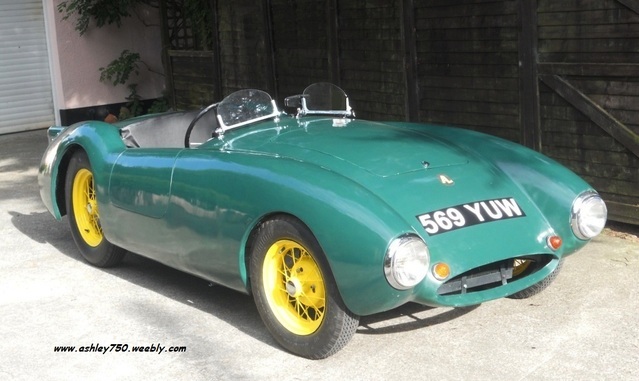 When we found the 1950's article in Motor Sport about Ashley's we concluded that this may have been one of the 'factory made' kits. Bellamy front suspension, Bowden 'over the top' front brakes, the Ashley 750 lwb body and sheet aluminum panels in the engine bay, cockpit and boot. The only thing really missing was seats (and a working gear change mechanism). 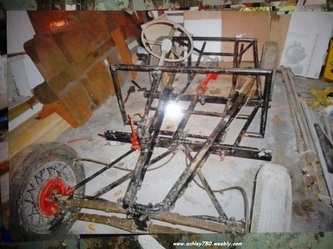 It had allegedly been raced but nothing about the car (engine, tyres, instruments etc) backed this up. The car then sat at the back of our garage until last year when due to a lack of space we did actually get round to making it road worthy. We didn't really restore it, we just got everything to work and polished it. 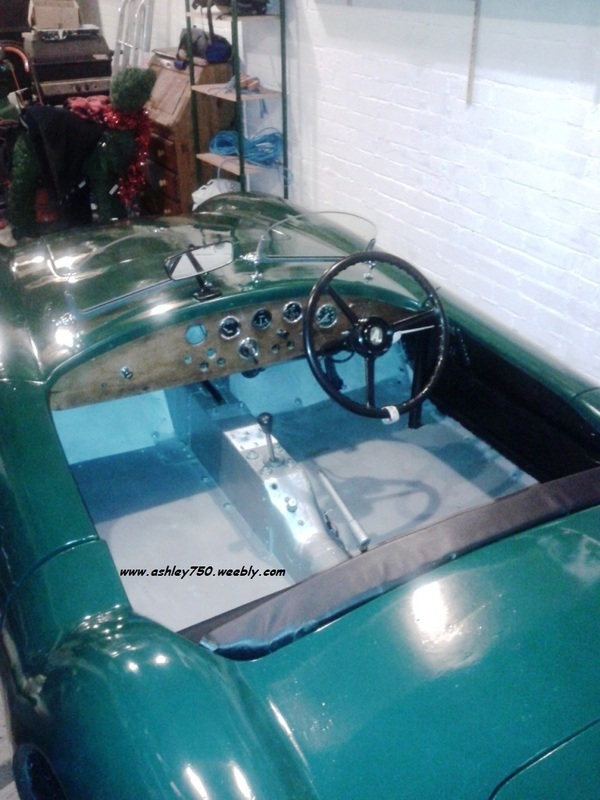 The laminate colour is Green (we have had sprayed it Green as the original body did not polish). 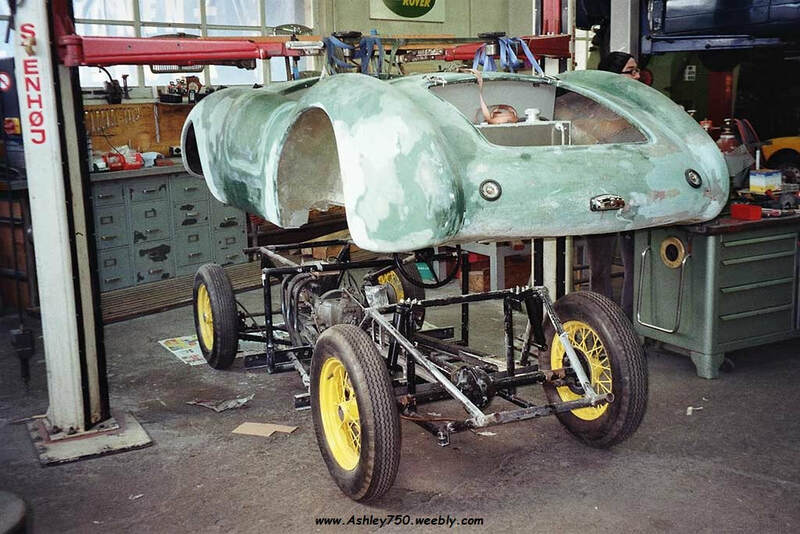 Ashley date - we estimate it at 1957 because the configuration of the rear chassis seems to change between the 1956 and 1957 in the Motor Sport adverts. Our car has the 1957 configuration but there are weld marks on the chassis where they have removed/changed the position of the tubes from the 1956 locations. We tried to get it registered as an Ashley but the DVLA wouldn't do it. 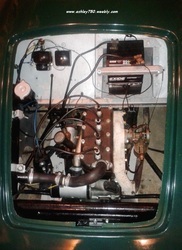 It is registered as a 2 seat Austin 7 sports. This first one was in the Austin 100th anniversary rally at Croften Park, Longbridge. 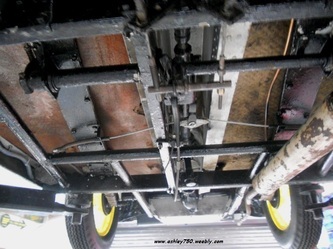 It was parked in the 1934 line of cars so the chassis is almost certainly a 1934, however he has no other details. 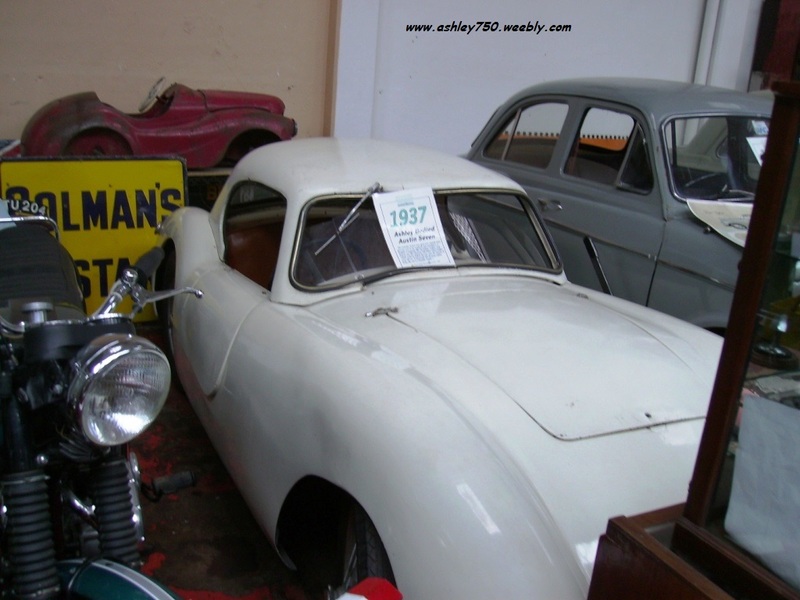 The other two photo's were believed to be taken at the Madog Motor Museum in North Wales and shows a 1937 Austin 7 with Ashley 750 body and GT Hardtop, The museum has now closed down so it could have ended anywhere. that this was the same car as shown above. It is unfortunate but the Mouldsworth Museum has also closed now. to a guy in Switzerland. 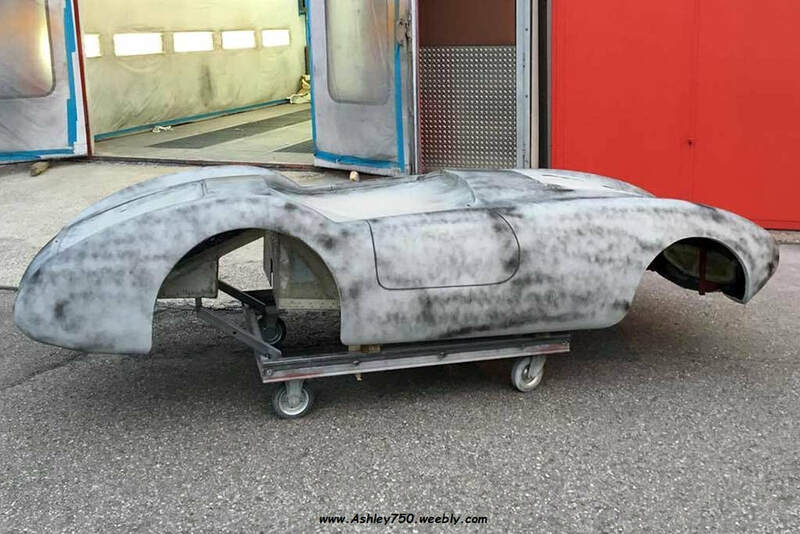 Markus was interested in finding out what equipment would have been installed in the original Ashley 750's back in the late 1950's. "There were no floors supplied, dashboards or seats, it was just a case of what you had or could get cheaply, like plywood floors cut to the shape required, a plank of wood for a dashboard or sheet of Aluminium (if you could get any) cut and fitted in with f/glass, seats from an old car cut down to fit, all stuff like that. Remember it was not many years after WWII and things in UK were not very plentiful, so we made do with what we could get, that's why specials came into being as all the steel was going into new cars mainly for the Export market or the UK rich and famous, the home market had to make do with old pre-war cars and then along came f/glass". equipment to incorporate in the car. dealt with would be long gone. just click on the button below to see. contact page or email below.